Oh hello there. Me again! Today I was just thinking about how far I have come with a lot of things and one thought popped into my mind. I realised sometime in the beginning of the year I was on a brink of destruction, hated a lot. It was a very bad moment and then one day I decided to sit in silence, breathe and refocus. It was not an easy thing, I tell you things stayed the same but I did not. 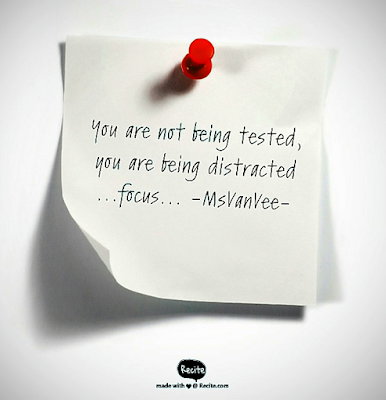 I started noticing, minding my surrounding and then it hit me, “I am not being tested, I am being distracted”. Many times as Christians or people we get to those moments and we tend to think this is a test, everything is going bad but have we ever stopped to realise that maybe we are being distracted, pushed off the way without realising by being made aware of all things that are not going well. What’s your distraction today, what does it look like... a ball of hate, socks on the floor, dirty dishes, a bad knee, broken kettle. Whatever it is today, I ask you to TRY this… sit in silence, breathe & refocus.